WOOOOW, I can't believe I got my first DD !!! Thank you sooooooooooooooo much, I really feel honored ! That made my day ! And thank you so much everyone for such a nice feedback, I really appreciate. So absolutely great in all kind of ways! stunning portrait of my super hero! Yeah, I was gonna try this too but just everyone does Kafka! well deserved DD. It's great work! I can't stop staring! Beautiful interpretation. With an awkward face, yet elegant hand, each word leeching blood, a page is filled. Torn and unknown to all but his readers, he was momentarily whole. Those who did not know him chose a spectre. Until gaunt from consumption, two worlds he kept afloat. Your work is fantastic yet insightful. Thank you. Wow, now that is a very inspired and thoughtful comment. I really appreciate and truly thank you matta53. Thanks for sharing your work. I'm new to this site and uploading slowly. I've got tons of stuff, some uhh... different. Check up and comment if you've the time? Thank you so much for the feature ! Thank you ! Ah cool, I've got one too. 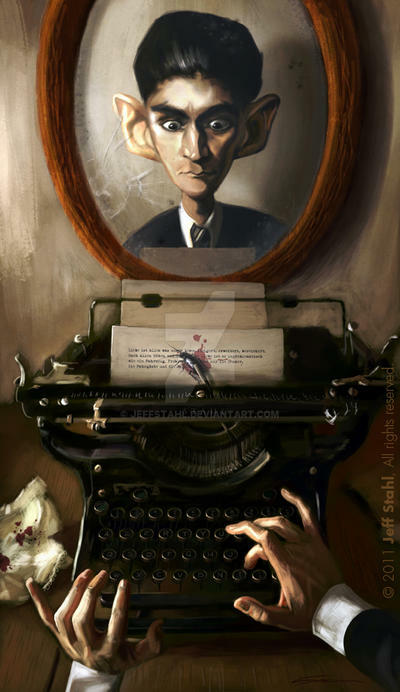 It's an old Underwood I actually used as reference for this painting. Thank you for the advice and the link ! Wow, this is so cool! Love it! It took me a couple seconds to get the joke, but now I can't stop giggling. Beautifully done! He he ! Thank you ! gross but this pic blows my mind!!!! There's is reason for this bug to be in this piece, Animelover Thanks ! Glad you like it, thank you ! Kafka was strange and interesting person. And he greatly suffered because of conflict with his father. So I'm really sorry for him.